Pollution and climate change are having a negative affect on many species in North America, and around the world. One of the most important issues is declining frog populations, which has a major impact on ecosystems as a whole. The Vancouver Aquarium's "Frogs Forever" program highlights the issue of frog extinction, as part of a global initiative to save frogs launched by Amphibian Ark. To show support for frogs everywhere, this artist is creating something swamp-like. Exotic frogs are known for their bright and bold colors. This selection of beads will not only represent these fabulous creatures, but are suitable for a classy piece of jewelry at the same time. 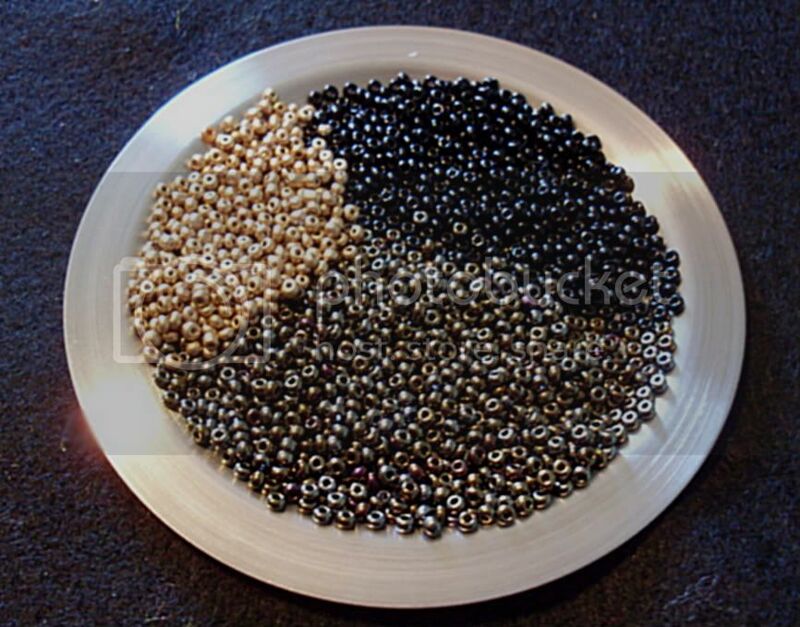 Included in the palette are opaque black, opaque yellow and green iris mix seed beads. 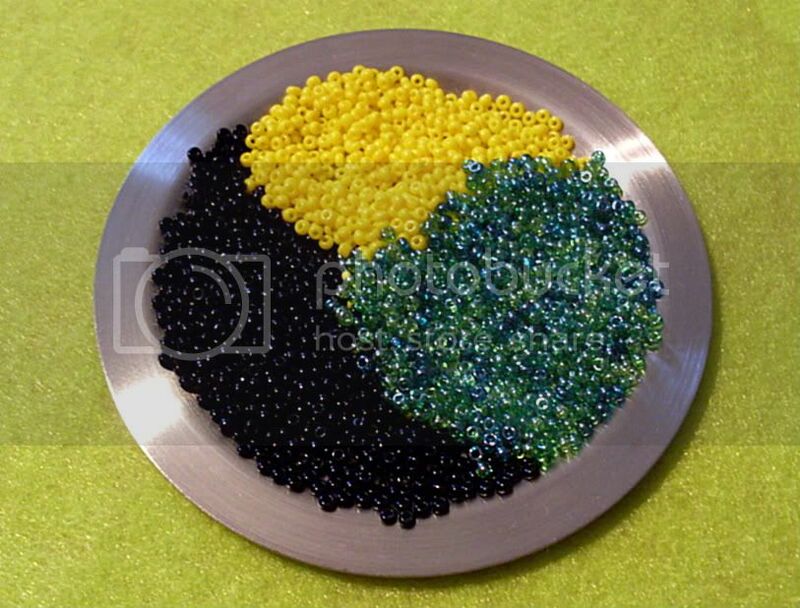 With yellow used as a background color, the black and green beads will look fresh and bold. Something vine-like will have a rainforest appeal. "Amphibian" is a clasp free spiral rope necklace - a continuous chain approximately 40 inches long. 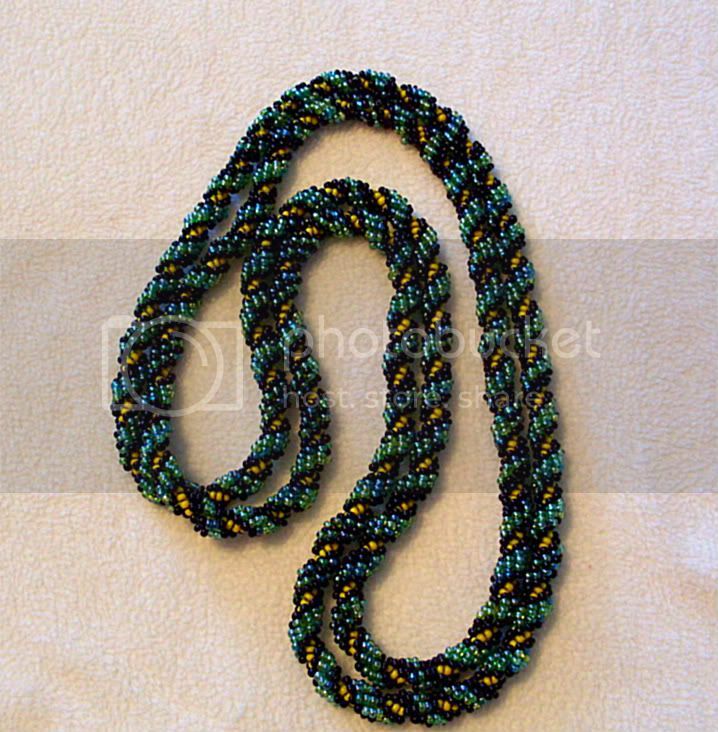 The pattern of green and black beads alternates throughout the rope, giving it a more natural appearance. When I first began beading, I wasn't entirely happy with the pattern. After a few inches, I thought I might regret the random look. But I would rather experiment and make something that at least I can wear, than rip out stitches and waste precious Fireline. So I kept at it, and eventually the design grew on me. It turned out much better than I expected, and I've decided to add it to my line of wrap-around necklaces, which I hope to launch early next year. Sometimes the beads themselves are all the inspiration one needs, and nothing beats a great seed bead mix. Whether purchased or created, the chaotic look of mixed beads has definate appeal. They can be paired with a single contrasting or complimenting color for a bold statement, but these beads need to stand alone. 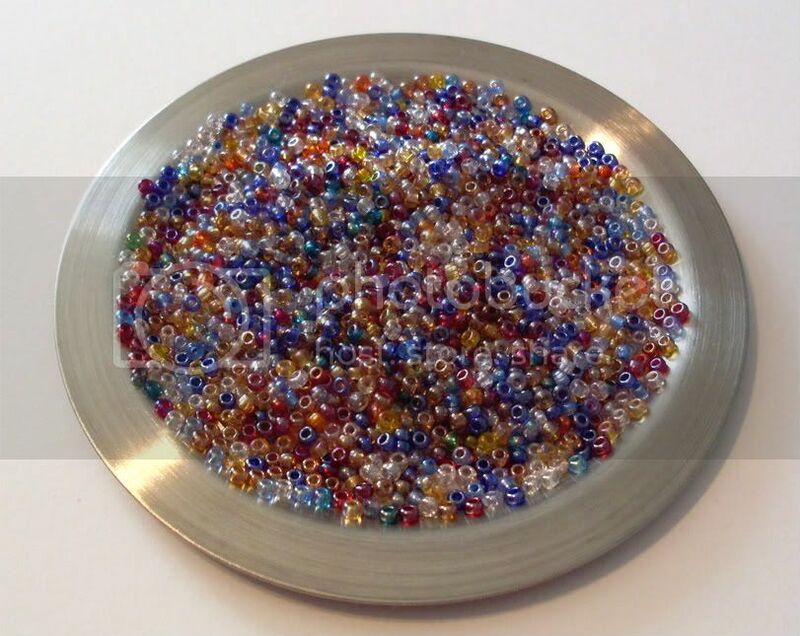 This bead mixture is made from multi-colored transparent iris seed beads, from Canadian Importer JohnBead. White and beige stand out among reds, blues and yellows, with a dash of purple, brown and green for good measure. 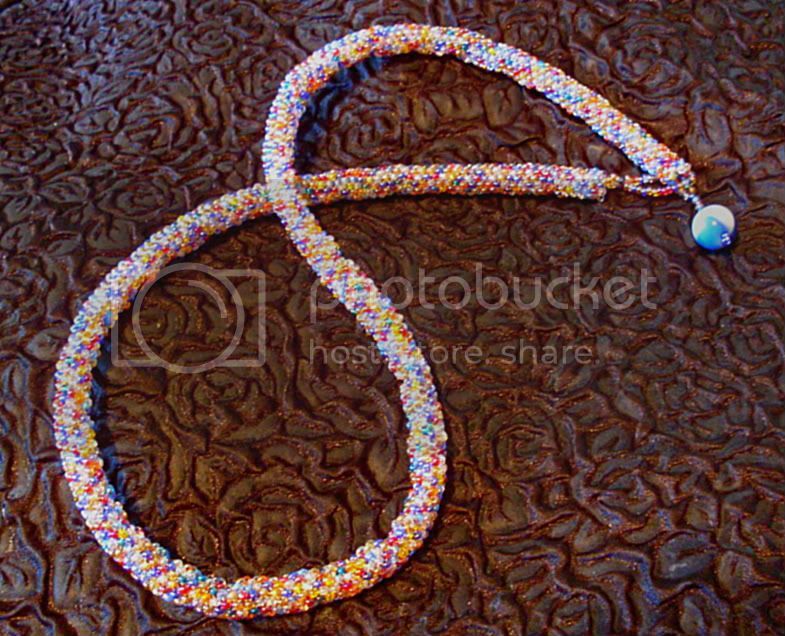 Presenting "Confetti Rope". A simple peyote stitch tube becomes a bright, cheerful necklace with these multi-colored seed beads. The necklace measures 22 inches (56 cm), and features a lucite bead clasp. With 12 beads in the base row, the peyote tube has an outside circumference of 1-1/4 inches. It can also be wrapped three times and worn as a wrist bangle. Use or create your own bead mixture and let it stand out in a unique piece of beadwork. Share your pictures and ideas on the Beading Challenges Forum. 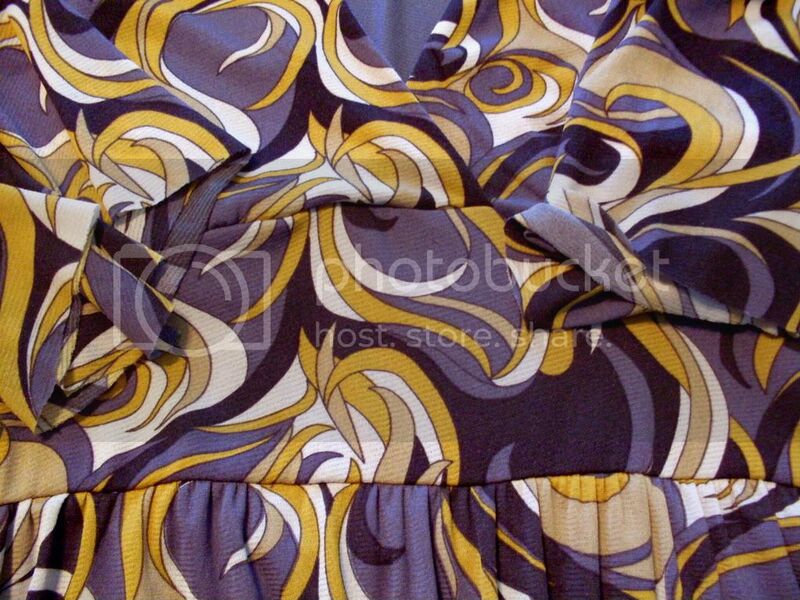 This large print dress was purchased at a summer clearance sale. The gorgeous colors and pattern deserve a custom necklace to compliment it. The dress has a v-neck and empire waist, so something long and slinky will be just right. 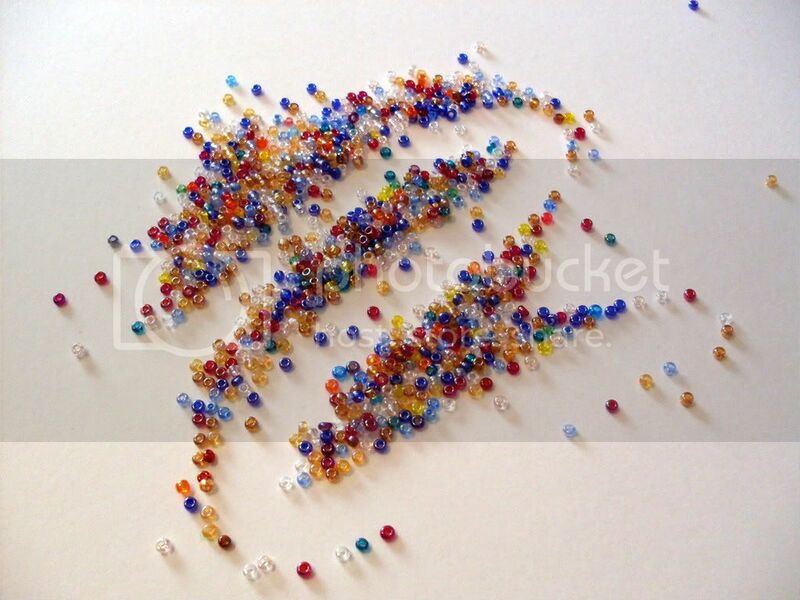 This selection of Czech glass seed beads is a near match to some of the bolder colors in the print. Without being too over-bearing, they will be able to compliment the dress with elegance. The palette includes matte black, brown iris mix, and true gold. This is "Brown Beauty" - a St. Petersburg chain necklace in a striped pattern, accented with gold beads. This clasp-free necklace measures 56 inches (142 cm), and can be wrapped twice for a variety of lengths and shapes. It makes a great accessory for the print dress, and may be the inspiration for more snake-like necklaces to come.